When I first heard that someone was going to make a remake of the classic Halloween, I was skeptical and I always feel that way when someone wants to tinker with a classic. But when I heard that someone was Rob Zombie of the kickass The Devils Rejects fame, there were reasons to be hopeful. I mean this is Zombie we are talking about, making some awesome horror movies, the kind we have not seen in a while. Initial reviews from critics say that this is the second greatest Halloween/Horror genre movie ever made where Rob Zombie restores the grandeur of a horror movie. I mean with a tag line of Evil has a Destiny, how can one go wrong with Halloween the movie . 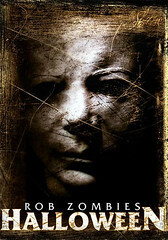 The plot outline (from IMDB) of Halloween the movie is that after being committed for 17 years, Michael Myers, now a grown man and still very dangerous, is mistakenly released from the mental institution (where he was committed as a 10 year old) and he immediately returns to Haddonfield, where he wants to find his baby sister, Laurie. Anyone who crosses his path is in mortal danger. Zombie doesn’t explain Myer’s evil so much as show it brewing which makes for this classical confused character who can’t explain the evil within and results in some truly terrifying scenes for us. In this movie, you end up actually caring for the characters in the movie hoping something bad does not happen to them. I mean we all saw the SAW movies, the HOSTELs but how many times did you care about that character. Yup, never. You end up being really moved by Sheri Moon’s character and other characters where it feels like a Greek tragedy where characters commit horrible acts not driven by their weakness but by their nature. But this movie is definitely outstanding and should be the best horror movie to come out in the last five years, a must watch when it releases in August and when the DVD for this movie comes out it shall take its place beside the original Halloween movie.